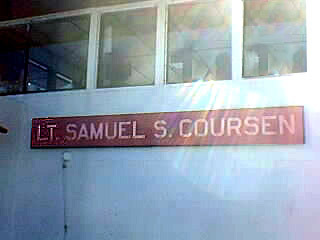 Above: The ferry name -- Lt. Samuel S. Coursen. He was a 24-year-old 1st Lieutenant,in Co. C, 5th Cavalry Regiment, who on Oct. 12, 1950, near Kaesong, Korea, distinguished himself by conspicuous gallantry above and beyond the call of duty. 4th of 74 views in NYCHS Governors Island prison history virtual tour.